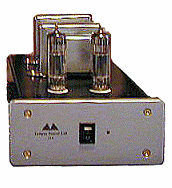 So Gary Krakow writing for MSNBC.com called my attention to some nifty little tube power amps by a company called Antique Audio. 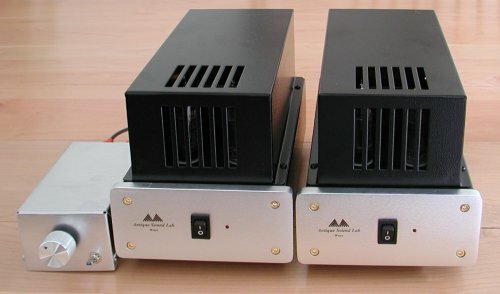 These little monoblock power amps only do 8 watts, but they're also only about $100 apiece, or $120 with decorative covers. I've played my guitars through tubes for years, but I haven't used tubes for hi-fi since I threw away an all-tube Sherwood amp I used in highschool. Drat, probably woulda been worth money now. So I did a bit of rooting around and finally found a dealer for Antique Audio in the Seattle area, Adire Audio. They couldn't get the amps, as that MSNBC article had caught Antique Audio a bit off guard. But I was patient, and kept calling Adire, and finally they notified me they'd gotten a pair in. I went and picked 'em up. They're really pretty in a not too over the top kinda way. My next dilemna was how to drive 'em. I don't have a tweak hi-fi setup by any means. No separate preamp or any of that kind of stuff. Since the specs for the amps indicated that the output of a standard CD player would drive them to full volume, I decided to build a passive preamp, an oxymoron if there ever was one. Note the guilty pleasure of a simple "bright switch". Coming from my guitar amp heritage I added a super tweazy switch to kick in a little extra air in the high frequencies using the same ultra simple bright switch approach found in about any Fender guitar amp ever made. I must admit I didn't get 330pf capacitors at Radio Shack. I happened to have those around. But in a pinch you could of course put 3 100pf caps in parallel and get about the same result. Caveat: I've got a bit of rock'n'roll hearing damage from my years of playing in wild rock bands, and frankly I don't listen that loud usually these days. So listening more softly, and taking into account good ol' Fletcher-Munsen and his observations about how the ear responds in a distinctly non-linear manner depending on volume level, I thought it sounded pretty fun to have a little extra bump in the high frequency response. When you click the switch off you're back to hi-fi purist flat response, but I find I'm running it more with the switch in the fun position. Up to you. Anyhow, it's a quick project to build, about 2 hours including the trip to Radio Shack. And the resulting system is darn sweet sounding. I'm driving some Clements two-way speakers, using an old Sansui CD player. It's way more fun than my previous Sony solid state amp which has a lot more power. There's amazing reading out there on the 'net about high end passive "preamps", with folks obsessing about the kind of wire being used, the type of ladder network attentuators and so forth. I just used cheap-o Radio Shack parts, and I'll bet the sound is within a fraction of a percentage point of what you'd get fretting about the last iota of parts quality— it's still way less to put in your signal path than any normal preamp. And these amps rock. I'm surprised at the volume level they'll achieve with my Clements. And being only 8 watts you can turn 'em up to where you can start to enjoy some of that juicy harmonic distortion stuff the way that only tubes can do it. I'm liking the rig a lot. So crack out the ol' soldering iron.